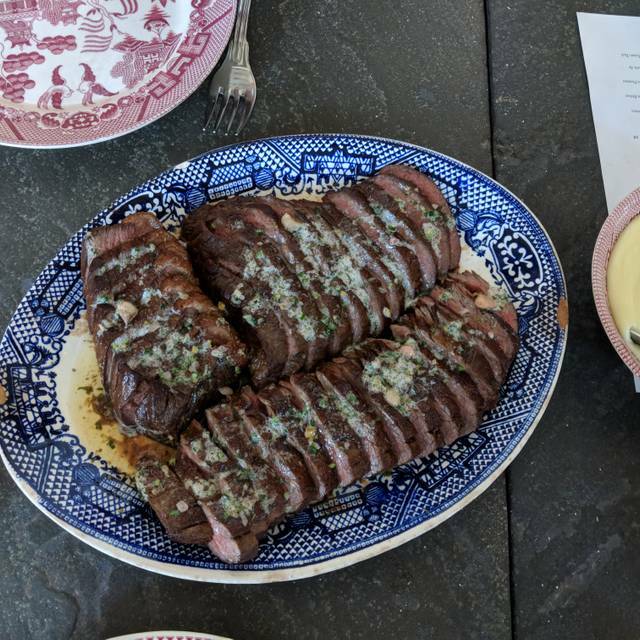 Located in Seattle's Capitol Hill neighborhood, Bateau is a beef-centric, French inspired restaurant with fresh, local ingredients and bold flavors. Bateau has an extensive wine selection including local and imported wines. 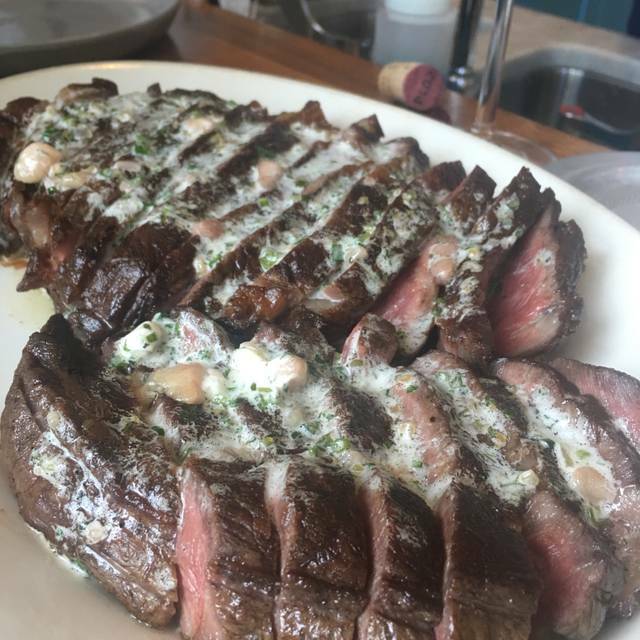 Bateau's selection of steaks are butchered and dry-aged in house and presented on a chalkboard that changes daily. Steaks are butter basted and finished with your choice of finishing butter. Chef Taylor Thornhill also offers a 5 course beef-centric Tasting Menu with optional beverage pairings. This place gets starts all around. The staff are attentive and knowledgeable about all aspects of your dining experience from wine to cocktails to the food itself. 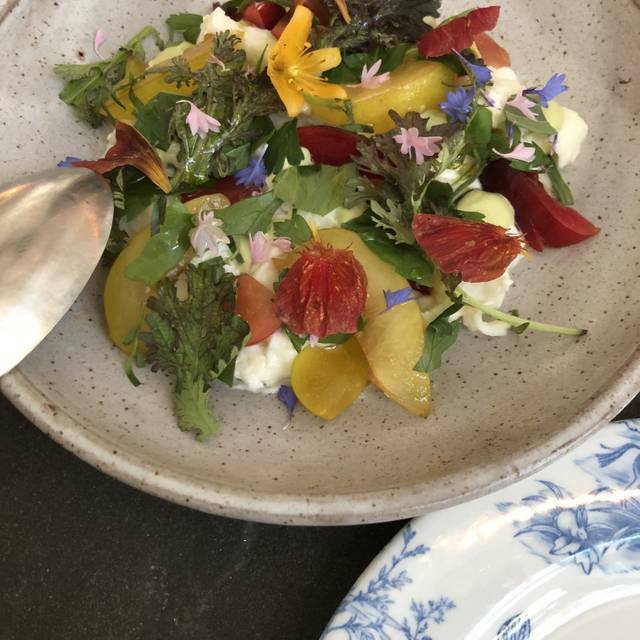 They have a menu that is inspiring and changes seasonally. Don't miss an experience here! Overall a very disappointing experience for many reasons: 1) We had a 5:30 reservation and arrived 7 minutes early. There were only 2 occupied tables, but the hostess said “We can’t seat you yet so you’ll have to wait at the bar.”. Really? We waited 15 minutes and were finally allowed to be seated at a table. 2) The menu is not well balanced - very few greens/veggies to balance out a very meat-heavy menu. We ordered the Ruben appetizer, which was so salty we couldn’t eat it. We shared the salad of the day, which was fresh greens loaded with a salty tuna on top that overpowered everything. 3) We had an early reservation and they were already out of many of the smaller cuts of steak. We didn’t get our first, second or even third choice. 4) We ordered our steak medium and it came out medium well. At $125 we expect perfection... and it absolutely was not (and our server didn’t come back to ask if it was cooked to our liking. 5) To the last point, the service was cold and not terribly friendly or efficient. 5) The ambience is cold an uninviting - hard wooden cane chairs, no warmth whatsoever. There were also several families with kids, which made it feel like a cafe vs. a $300+ special dining experience. We were super excited to try this place but sadly won’t return, nor can we recommend it to others. Bateau was the last stop of my big birthday surprise day for my boyfriend. I’d been to Bateau before, but this was his first visit. He loves steak so I knew Bateau was the perfect place. The entire experience was AMAZING!!! The service was beyond expectation. Not just from our server, but from every employee we encountered. And the personalized happy birthday note waiting for us on the table was such a fun surprise. The food was so delicious, I know I’ll be thinking about this meal for a while. All in all, this place never fails to amaze me. Thank you! The food was delicious, the service outstanding! Definitely a great place for a date night. One of my favorite restaurants in Seattle. Raises the bar every time. This is one of the top rated restaurants in the country. If you love and appreciate food and where it comes from, especially beef, Bateau is a must. This is a fun concept and you can see, and taste, the care put into their food. The staff is extremely knowledgeable in the cuts of beef and are very helpful when making your selection. Chef Renee is absolutely brilliant... and that’s even more solidified being a James Beard award winner. I wish she would extend her restaurant family to a location in Florida. Bateau is as much an experience as it is a wonderful meal. Who knew that there were so many delicious parts to a cow that I'd never heard of? Me, I'm a pretty average guy, know what I like when I taste it and generally go with the flow. My dinner mate - foodie. Big foodie. He said that the sirloin was the best he had ever tasted. I agree. The Bread and Butter starter? Delicious. The Frites and Mushroom sides? Delicious. The steaks? Extremely delicious. This is not your Father's steakhouse. No bearnaise, no oscar, no A1, just meat, butchered and cooked to perfection. Take your Father (or your Mom, sister, neighbor, guy who calls you "Bud" at work). But go. Just an incredible experience from start to finish! Go early for the best parts. They only have one or two of each kind everyday so go early to get the parts you like. Just delicious. Steaks were wonderfully done, the wine list was incredible and the cocktails were variations on the greatest classics. Would definitely recommend. 28 day aged ribeye was outstanding. Pleased to see them offer several natural wine options by the glass. Also had the Reuben mille feuille which was remarkable and would have again. For the price, the quality of the steak was not what I was expecting. The music was also oddly generic, almost elevator-style. While lovely, it's a bit austere; maybe better for a nice dinner with coworkers or parents vs. a date. The special "sidewalk" salad was a standout, with an ultra lemony dressing and salt-cured egg yolk. Service was very good. However, the taste of food was way below the bar. 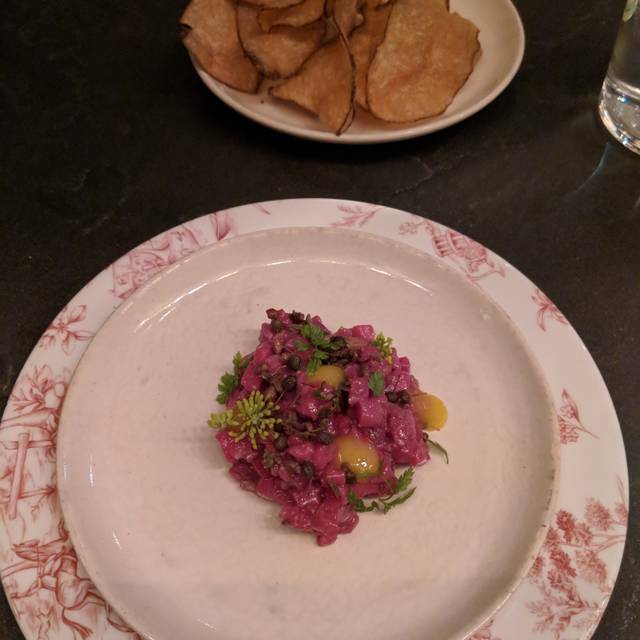 Steak tartare was lack of flavor. The ribeye and filet were full of butter flavor, it covered all the original beautiful taste of the steak. The meat itself was probably very good, but the way they cook was not able to shine the value of the steak. Amazing dinner. Exceptional service. Everything was perfect. Had high expectations heading in and Bateau met them all. Beautiful decor was elevated due to the beautiful weather and opened windows flushing the restaurant with the warm breeze and sunlight. Excellent cocktails and an impressive wine list followed. 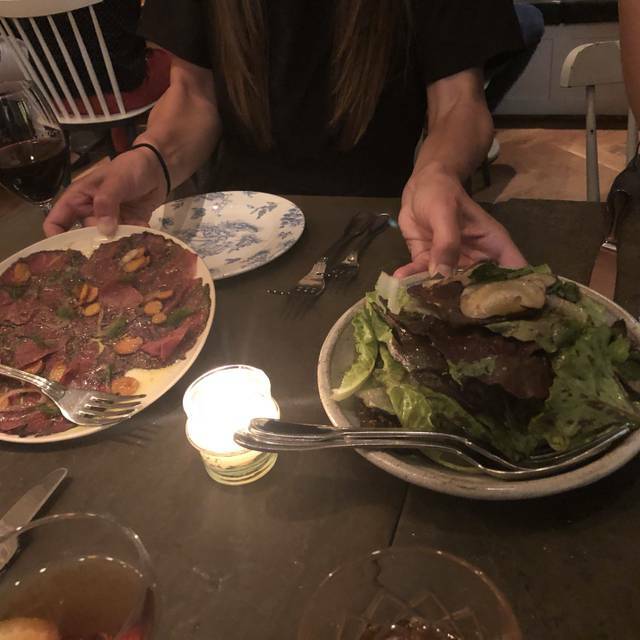 The waitress recommended 3 very tasty & unique steak cuts and unique flavored butters to accentuate the beautiful meat. The kale gratin and the cauliflower side dishes impressed but the mashed potatoes were common. Service was excellent and made our evening special. The food was not worth the cost. Too much hype and not enough real value. They have a chef’s tasting menu, which can only be ordered if all 4 people in a party do so - for $100 per person. And the server noted twice that it is not really a complete meal without also buying steaks to go along with it. Scam. The steaks were delicious. All the sides were too salty. Excellent service and high quality food. Couldn’t ask for anything better. The sweetbreads were cooked to oblivion and were covered in a overwhelmingly tart beurre blanc. The over cooked meat became soft and gray punctuated with a slap you in the face acidity. No bueno. 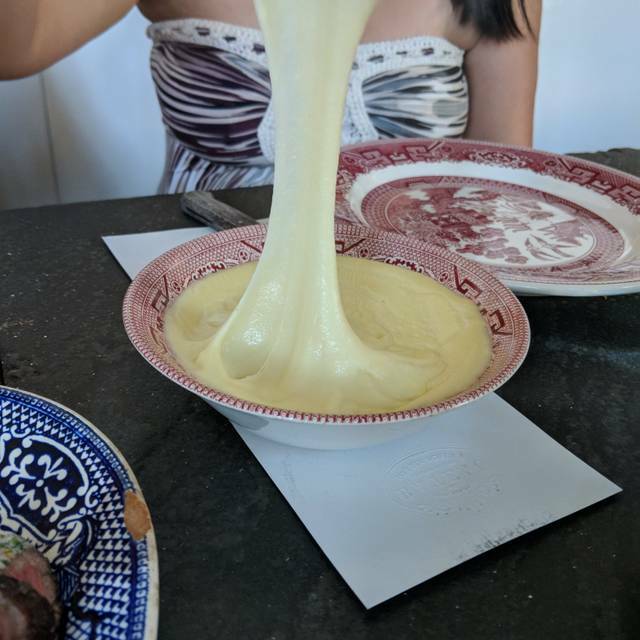 The Aligot was delicious but was a dish of diminishing returns as it quickly cooled and turned into a fairly unappealing gelatinous goo. The steak was ok. I had a Bavette which was perfectly cooked but rather tough. As a steak goes for 47.00, it was uninspiring to say the least. Top marks for atmosphere and service, perfect martini and a decent half bottle of Bordeaux. All in with service 170 for one. I’d maybe go back for the burger as it looked great. Like many restaurants in central Seattle "Bateau" is overpriced for what you get. The place, whose name implies is French for "boat", is on the other hand a steak house which serves several cuts of beef cooked French-style, pan fried in butter. The ambiance is nicely minimal and elegantly casual. My girlfriend and I got there shortly after it had opened and there was only one table seated. We had a reservation 15 minutes later. They didn't sit us right away mentioning that the waitress may have gotten overloaded and they suggested to go to the bar until reservation time. The food was good but not great. Portions are somewhat small in size but not in price. I ordered a 77-day-aged steak, which was priced at $45 (plus tax and tip) and my girlfriend the vegetarian entree, a cannelloni stuffed with kale, priced at $20. We also ordered two appetizers and one serving of fries, which were probably the best among the rest of the food. The steak was ok but a little chewy. When I mentioned it to the waitress I saw the terror in her eyes probably thinking if I wanted to send it back. Which I didn't but thinking I should have as had to work my teeth through some of the bites. The service is attentive but a bit slow in bringing drinks and a bit too quick in taking away plates or glasses that still had food or liquids in them. Last but not least, the bill can easily add up as a 20% service charge is automatically added to the already taxed subtotal of your bill, which I am not sure that that's how tips should be calculated (rather on the pre-tax amount) or even legal? Which also defies the meaning of "gratuity". So bear in mind that whatever you see on the menu you need to add a good 30% to the listed price as that is what you will be paying. Went to celebrate our anniversary. We had the first reservation of the night at 5:00, to our surprise we were the only ones in the place for almost an hour ( it was a Wednesday night). Our waiter was very laid back but incredibly knowledgeable and explained the menu, etc. I had come specifically to try the burger, which he didn't try and talk me out of, but suggested the Oyster cut of beef to go along with it. We had the croquettes to start, and mushroom and kale gratin as sides. Everything was incredible. Really one of the best meals we have had in a long time, the burger was done to perfection as was the steak. And contrary to many posts, our bill was reasonable, less than $130 including a glass of wine. Would highly recommend. Food is amazing here. Probably some of the best steak I've ever had. Service was slow. I know it takes a while for the steaks to be cooked. It was the post dinner pacing that was exceedingly slow and felt like it was impossible to find our server to move things along. Service was excellent. Environment was nice and cozy. It was expensive. Do you have lots of money sitting around from your tech job? Then definitely go eat here. Do you, like me, work in some other industry that pays you a normal wage for hard work? Then I'd think twice about going here. As we expected food was good, the service was good and we had a enjoyable evening with a good meal. I eat here at least once every two or three months and is my go-to choice for where in Seattle to go when I want beef on the menu. I expect I’ll be back again soon. 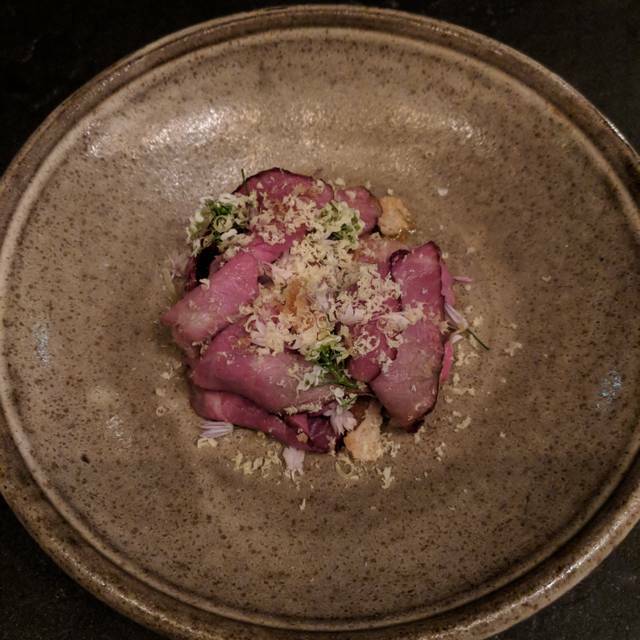 On this occasion we had the tasting menu (my second time doing so) with pairing and added meat course picking from several of the cuts on the daily list. We enjoyed every bite and sip. Our absolute favorite restaurant in Seattle. The quality of meat and the overall ambience, service, and experience is second to none! Bateau was amazing. We went for Valentine's Day dinner and were not disappointed. We do not know much about steak, or fine dining, but the staff was very helpful and provided background that helped us make choices we were very happy with. The four courses offered were all food I'd never had before and honestly would never have ordered on my own. However, they were absolutely delicious and gave me an appreciation for things like tongue and ox tail that I never thought I would have. Of course, we also ordered the filet mignon. Quite simply, it was the best steak I've ever had and it was enough to change my view on steak completely. Yes, the restaurant is very expensive, but you should know that by now if you're reading reviews. 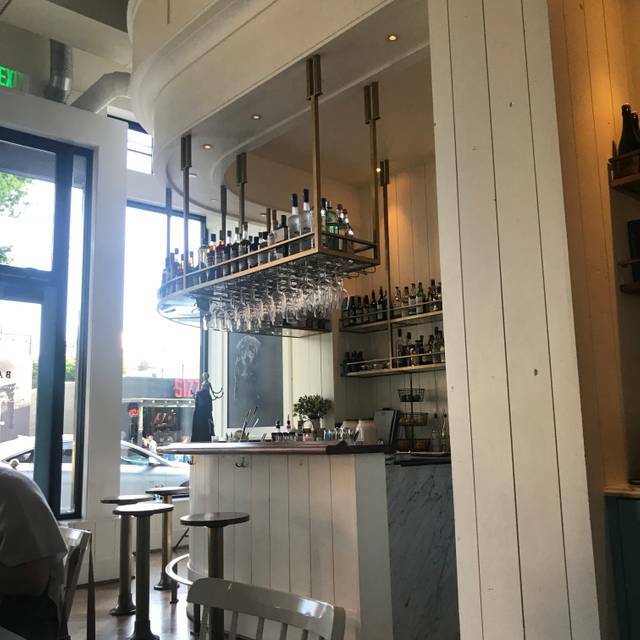 If you make a reservation, know that you're going to drop some money and that gratuity is included (which seems to be the new Seattle standard). If you have this mindset, I sincerely believe you won't be disappointed. Be as open-minded as you can be regarding the menu, especially if you're like us and have not had a lot of fancy food before. Everything, and I do mean everything, is delicious. Splurge. You won't regret it. Amazing! An incredibly well cooked filet, plus a tri-tip steak outstandingly flavorish! I'd recommend it to anybody, though I hear the real star is the burguer. Next time I go (because there will be a next time!) I'll ask for it. Service was great. 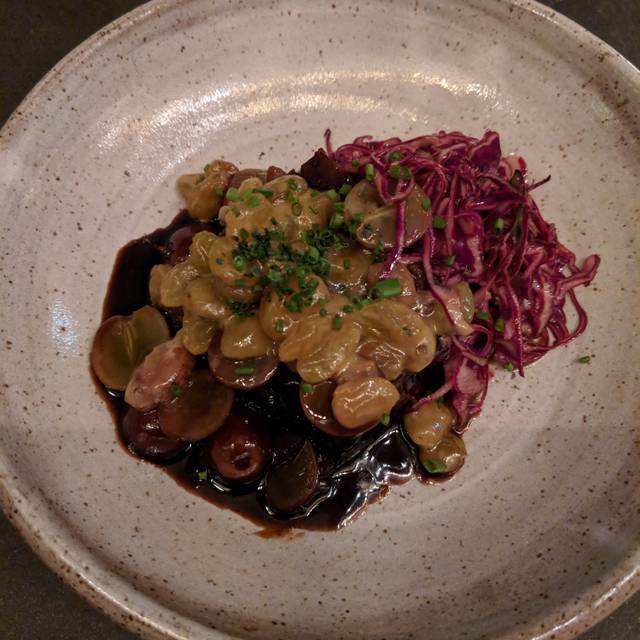 This was my first time dining at Bateau and I had a spectacular experience! Our server was extremely informative and helpful with going through the menu. I ordered a port at the end of the night that was out of stock, and the bartender came to our table and offered server all suggestions on its place. I would definitely come again for the food, but I was really impressed with how well taken care of we were. Fantastic food and excellent service. Our 2 person meal with wine and drinks was $400 so this is not an inexpensive place to eat, however, I also had the best steak I’ve ever eaten there. I plan to go back. Outstanding dining experience. Great food, service, and ambience. Will definitely return.